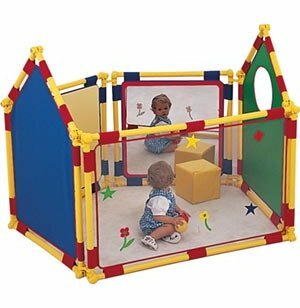 These colorful playpens offer an attractive alternative to traditional baby gates. 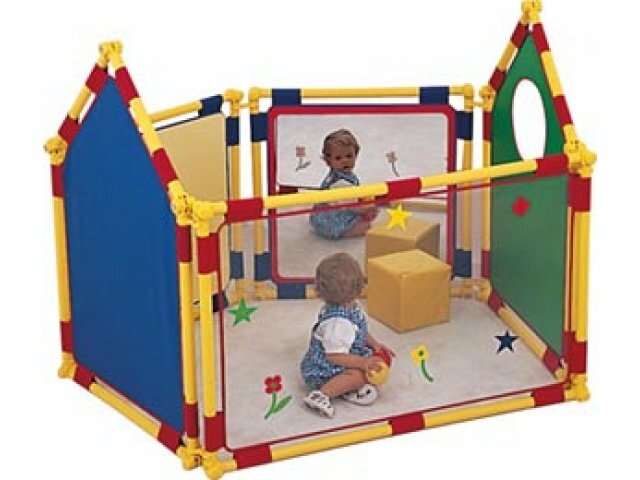 Alternating panels provide activities for babies while keeping them safely in an enclosed area. Includes wall and gate-latch attachments which maintain stability and allow adult entry and exit. Can be used as a room divider when opened up into a straight line and attached to plastic pedestal feet. Intended for children ages 6 months to 3 years. Versatile Shape: Five panels can be arranged in a circle as a playpen or a line as a room divider. Two-sided Play: Baby Corral encloses a quarter-circle (8' radius) play area for little ones to play on the inside or the outside. Worry Free: Wall and gate latch attachments keep babies inside while allowing adults to enter and exit. Unit is intended for children ages 6 months - 3 years.